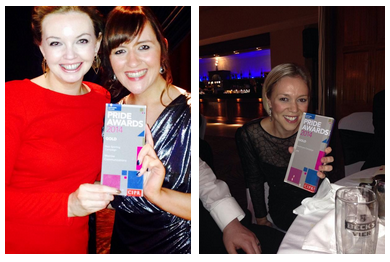 The best public relations campaigns, practitioners and organisations in Northern Ireland were announced this evening at the 2014 CIPR Northern Ireland PRide Awards at the Culloden Estate & Spa, Belfast. Over 250 guests witnessed Smarts Communicate pick up five Gold Awards, including two for their work with Bushmills, as well as the prestigious title of Outstanding Public Relations Consultancy. Judges credited Smarts overall approach for “moving away from a traditional account team structure” and “developing a model where clients have full access to all the specialisms the consultancy has to offer”. Particular credit was also paid to Smarts for “expanding their service offering, establishing an in-house film unit including editing, animation and post-production, which has driven significant revenues”. Ulster Rugby were recognised as the Outstanding In-House Public Relations Team, and also won the Best External Publication Gold Award for their ‘Beyond the game’ matchday programme. Other multiple Gold Award winners on the night included Coca-Cola HBC Northern Ireland, Jago Communications, Aiken PR, Translink, and Belfast City Council. Congratulations to all the winners at this year’s CIPR Northern Ireland PRide Awards, recognising and rewarding some of the most memorable and life-changing campaigns. This year winners showed a depth of creativity, strategic thinking and thorough measurement techniques. The awards are rigorously judged and showcase the international calibre of individuals and teams in Northern Ireland who are driving forward best practice, ethics and professionalism in PR. View full set of results (including details of silver winners, finalists and case studies).